Dealing with movement toward a nuclear weapons ban treaty will be among the most important issues facing the Trump administration and key U.S. allies in Europe and Asia. Seventy years into the nuclear age, something revolutionary is about to occur. It is likely that, within the next year or two, a majority of the world’s countries will declare in a legally binding document that they no longer accept nuclear deterrence as a valid concept in international relations. This will be the result of a nuclear weapons ban treaty, which is due to be negotiated beginning this month as authorized by the UN General Assembly on December 23, 2016, by a vote of 113-35, with 13 abstaining. Negotiating sessions in 2017 are scheduled for March 27-31 and from June 15 to July 7. The purpose of this treaty will be to prohibit but not eliminate nuclear weapons. In doing so, the intent will be to delegitimize nuclear deterrence, a concept that has been used to justify the possession of nuclear weapons among the five nuclear-weapon states, as well as the rationale for others inclined to seek their own nuclear arsenals. This will be an attempt to overturn what has been a central tenet of every U.S. administration since that of President Harry Truman, that nuclear deterrence is fundamental to international peace and security, at least until a safe, effective, and verifiable way to eliminate these weapons can be found. The United States and other countries with nuclear weapons regard nuclear deterrence as a key factor in the prevention of major warfare among the leading powers. Yet, this is not the only view. Nuclear deterrence has been under attack for some time on pragmatic and moral grounds. One view is that although nuclear deterrence has been effective in the past, it has become dangerous and unnecessary now and must be carefully replaced in a step-by-step process. Others maintain that the nuclear “balance of terror”—a phrase heard during the Cold War—has never been effective or morally acceptable and must be eliminated immediately. Understanding these radically different views of the world and their implications for world peace, even survival, should be a high priority. Dealing with this movement toward a ban treaty will be among the most interesting and important issues facing the Trump administration and key U.S. allies in Europe and Asia, who live under the U.S. nuclear security umbrella. The new Nuclear Posture Review (NPR), which President Donald Trump requested in a January 27 executive order, could be a major vehicle for addressing these issues. In any case, responding to this movement will be complicated if there continues to be a lack of U.S.-Russian talks on further nuclear reductions and both sides continue their costly modernization of nuclear forces. Since the advent of the nuclear age in 1945, the concept of deterrence and its related military and political expressions have gone through a number of stages in U.S. thinking: massive retaliation, mutual assured destruction, flexible response, essential equivalence, escalation control, deterrence by denial, intrawar deterrence, tailored deterrence, minimum deterrence, no first use, launch on warning, launch under attack, detargeting, de-alerting, and so on, not all of which have become official U.S. policy. The interactions among strategic and tactical nuclear forces, conventional forces, civil defense, and active defense have contributed to and sometimes complicated efforts to design a coherent and effective policy. One constant principle has been that these policies should contribute to stability and make war less likely. There is general agreement that any use of nuclear weapons would be extremely dangerous and that an all-out nuclear war could end civilization. As McGeorge Bundy, national security adviser to Presidents John Kennedy and Lyndon Johnson, put it years ago, one nuclear weapon on one city would be a catastrophe; 10 nuclear weapons on 10 cities would be a disaster beyond history. At the same time, nuclear deterrence has generally been considered fundamental to the prevention not only of such a nuclear disaster, but also of general conventional war among the major powers, at least on the scale of the two world wars, along with the use of other weapons of mass destruction, namely chemical and biological weapons, by these powers. All states that acknowledge possessing nuclear weapons, even North Korea, say that their purpose is for deterrence. Effective deterrence, however, rests on the credible threat to actually use such weapons, at least in extreme circumstances. This creates the dilemma in which leaders proclaim that such weapons cannot and must not be used, but this policy itself rests on the possibility of such use. Nuclear deterrence has a strong psychological component in that what leaders believe is probably more important than the actual technical facts. It is important to distinguish nuclear deterrence from deterrence in general. The concept that bad behavior will be punished, making any possible gains from such behavior not worth the risk, will surely continue to be a central part of international relations with or without nuclear weapons. Deterrence by denial, as advocated by supporters of large ballistic missile defenses, is an interesting companion concept, but not one that could realistically eliminate punishment from the equation. The issue at hand is whether, by holding nuclear weapons as an instrument of deterrence, one risks destroying the planet in order to save it. The theory of nuclear deterrence was originally formulated in the years after World War II by such seminal thinkers as Bernard Brodie, Thomas Schelling, and Herman Kahn. As the Cold War became more threatening, many others have grappled with these issues.1 Today, one could imagine the current situation—far from ideal but reasonably stable and familiar—continuing for an indefinite period. Yet, patience in fulfilling the promise to eliminate nuclear weapons, made in the nuclear Nonproliferation Treaty (NPT) and elsewhere, is running thin; and the prospects for further movement using traditional diplomatic methods seems bleak, at least in the near term. This has led to questioning the foundations on which nuclear deterrence is based, along with a serious uprising by a large number of non-nuclear-weapon states calling for a legally binding instrument prohibiting such weapons—a ban treaty. With some oversimplification, countries fall into five groups. The Big Five. The five nuclear-weapon states recognized in the NPT (China, France, Russia, the United Kingdom, and the United States) each endorse the concept of nuclear deterrence and use this as justification for having such forces. The Rising Four. There are four states outside the NPT that hold views on the deterrent value of nuclear weapons generally similar to the big five powers. Nuclear-armed rivals India and Pakistan, which are expanding their capabilities, abstained on the UN vote, although it is doubtful they would support a ban treaty as currently envisioned. Israel, which voted against the ban negotiations, is unique with its purposely ambiguous “nuclear potential.” North Korea, which announced its withdrawal from the NPT in 2003, voted for the ban negotiations, though it is outside most arms control activities and is currently expanding its nuclear-weapons capabilities in defiance of the UN Security Council. The Hosts. North Atlantic Treaty Organization (NATO) states such as Germany may host U.S. nuclear weapons but are non-nuclear-weapon states under the NPT. Although most are strong advocates of arms control and support the eventual elimination of nuclear weapons, they accept and depend on nuclear deterrence and therefore reject a ban treaty. The Other Allies. These are NATO states not included in the first two categories, along with other states with arrangements that place them under the so-called nuclear umbrella of U.S. extended deterrence, such as Australia, Japan, and South Korea. These states tend to be strong advocates of arms control and the eventual elimination of nuclear weapons. Thus far, they have not supported the concept of a ban treaty, and such support would be surprising because they look to the United States for security. The Others. These constitute a majority of the world’s countries. Nearly all are non-nuclear-weapon states located in nuclear-weapon-free zones, such as in South America or Africa. Support for a ban treaty comes largely from this group, among whose leaders are Brazil, Indonesia, Mexico, and the Philippines. Also included in this category are advanced European countries with strong histories of support for arms control but no direct relationship to nuclear weapons, for example Austria, Finland, Sweden, and Switzerland. A widely held view in this group is that nuclear weapons had little or nothing to do with ending World War II and deserve little or no credit for what is sometimes called the “Long Peace” since 1945. Some view the use of nuclear weapons through accident or design as almost inevitable and consider the possession of such weapons morally wrong. A variation on the above views is one that holds that nuclear deterrence, although probably still necessary for an extended period, remains at dangerous, overkill levels. The range of circumstances for which nuclear deterrence is relevant has become extremely narrow. “Minimum deterrence”—not defined but perhaps 100 to 500 weapons—would still be effective and would be a logical plateau on the way to zero. Many analysts are concerned that going to low levels or zero without effective verification and agreed elimination procedures would be highly dangerous. Still others worry about making the world safe for conventional war if the restraint provided by nuclear deterrence is removed. The nuclear proliferation argument is made both ways. On the one hand, failure of the nuclear-weapon states to give up their advantage may lead to proliferation by non-nuclear-weapon states. On the other hand, the removal of extended deterrence from non-nuclear-weapon states may also speed proliferation. A new and interesting twist on the morality debate is a claim that going to very low levels of nuclear weapons would actually be less moral than is the case at the current levels. The argument contends that a country with very few weapons would be forced to aim them at cities and civilians in order to achieve meaningful deterrence. The ban movement has understood that, in order to eliminate nuclear weapons, it is first necessary to eliminate nuclear deterrence. Efforts to do this have been underway for some time.5 If nuclear deterrence exists and is to be eliminated, it must be replaced by something at least as effective. If it does not exist, then there is no requirement to design an alternative system, making the problem far easier. Peace groups have difficulty talking about any form of deterrence because it involves the capability and willingness to kill large numbers of people. A useful precedent can be found in how the world dealt with another type of weapon of mass destruction. Chemical weapons went from being considered an essential part of the U.S. deterrence arsenal to being considered useless and dangerous. Other countries followed the same path, banning and eliminating this entire class of weapons in the 1993 Chemical Weapons Convention (CWC). Nuclear weapons could follow this same route to oblivion, but there are some important differences. While banning chemical weapons, the CWC did not leave the 71,000 metric tons of existing chemical weapons in limbo. It provided agreed procedures and timelines for elimination, put in place an elaborate and effective verification regime, and established a large international organization to implement the agreed procedures. None of this would be true for the nuclear ban treaty as currently envisioned. As far as process is concerned, a precedent often cited is the 1999 Mine Ban Treaty, also known as the Ottawa Convention. This treaty demonstrated that a determined coalition of countries and nongovernmental organizations can produce an effective legal measure without the participation of several relevant major countries. The treaty has been effective in removing thousands of dangerous, abandoned landmines and has affected in a constructive way the policies of states that are not yet parties. Yet, the parties to this treaty were themselves producers of landmines or had them on their territory and could remove them without any cooperation from nonparties. Over the years, there has been strong support from historians and military experts for the proposition that nuclear weapons played a key role in ending World War II, with each side avoiding a very costly invasion of the Japanese mainland. (The use of this historical example is a bit off the mark, in any case, because this was an example of compellence, not deterrence.) Likewise, it would be difficult to sustain an argument that nuclear deterrence has not had a powerful restraining influence on the major powers. During the Cuban missile crisis, it is clear that Kennedy and Soviet leader Nikita Khrushchev were very much aware of the danger of nuclear war and that this had a powerful restraining effect on them. More recently, U.S. military leaders came back from the 1991 Persian Gulf War saying that the United States could not have acted as it did if Iraqi leader Saddam Hussein had possessed nuclear weapons. This is an example of nuclear deterrence, although such statements were probably unwise and unhelpful to the cause of nonproliferation. Clearly, the acquisition of nuclear weapons by North Korea has reduced the military options available for dealing with that country. This also is nuclear deterrence. At the same time, grandiose claims regarding the effectiveness of nuclear deterrence are not justified. These weapons have not prevented non-nuclear-weapon states from attacking and provoking nuclear-weapon states, nor did they eliminate regional conflicts among non-nuclear-weapon states. The Korean and Vietnam wars were major conflicts that were not prevented by nuclear weapons. Recent research into the effects of the use of nuclear weapons showed that a moderate-sized nuclear exchange not even involving the five nuclear-weapon states could have devastating effects on the world environment, with global cooling leading to serious damage to agriculture and large-scale starvation.11 This became the catalyst that led to the so-called humanitarian initiative, now joined by about 127 countries and many nongovernmental organizations, calling for urgent progress on nuclear disarmament.12 The campaign held three international conferences in 2013-2014 and had a major presence at the 2015 NPT Review Conference. An open-ended working group was authorized by the UN General Assembly and held three sessions in Geneva in 2015 and 2016. It brought its case to the General Assembly in October 2016. As noted above, the General Assembly authorized ban treaty negotiations to begin this year. Such a treaty would presumably be a rather short document making nuclear weapons illegal.13 The actual elimination of these weapons would await a later, much more complicated agreement containing agreed elimination procedures and an effective verification regime. Thus far, all states with nuclear weapons oppose this approach. If only non-nuclear-weapon states joined, they would presumably have no new legal obligations because they are already prohibited from acquiring nuclear weapons by the NPT. This could result in a curious legal situation. If a state with nuclear weapons joined such a treaty, it would face a complicated situation regarding what it would be required to do with its now illegal objects and exactly what activities with respect to them would be legal and illegal. This situation could continue for an extended period. Assuming the world does get serious about prohibiting and eliminating nuclear weapons, the problem becomes how to get off the tiger’s back without being eaten.21 There are several serious problems to be solved in attempting this feat. They principally involve reaching agreements on definitions, verification, elimination procedures, and timelines; how much latent capability to re-create nuclear weapons to allow and to whom; and a new system of deterrence that does not rely on nuclear weapons. While acknowledging the major contributions of past nuclear arms control treaties, it is important to recognize that none of them actually required any reduction in the number of nuclear weapons, contrary to popular belief. The reductions and other constraints in these agreements were focused on launchers, missiles, bombers, and the weapons deployed on them. Not a single nuclear weapon has ever been dismantled under procedures internationally agreed and verified. This is frequently overlooked by those who claim getting to zero can simply use existing agreed reductions procedures. No such procedures exist. The great powers might find the transition less difficult than they may have thought. With advancing technology, many of the tasks formerly assigned to nuclear forces can be performed by advanced, precision-guided conventional forces, including drones in some cases.22 One should be cautious in drawing conclusions about whether this emerging capability would be more effective in preventing wars among these powers than the current situation. Another factor is that precisely this growing conventional capability, which appears to favor the United States, is making the elimination of nuclear weapons more difficult, notably in the view of Russia. There are several scenarios for what lies ahead, but a likely scenario would be that a substantial group of non-nuclear-weapon states and nongovernmental organizations will succeed in negotiating a ban treaty within the next year or two. A significant number of countries will join the treaty, but no nuclear-weapon states, NATO members, or states under formal extended nuclear deterrence arrangements will join although some segments of society in these states will be sympathetic to it. This process could lead to better understanding between the nuclear-weapon and non-nuclear-weapon states, but it could also harden and widen their differences, with damage to the NPT regime. For example, NPT review conferences would almost certainly become even more contentious, with agreed final documents almost impossible to attain.25 In the states opposed to the ban treaty, there would probably be some progress in reducing the numbers and roles of nuclear weapons in response to pressure from the non-nuclear-weapon states. The capabilities of conventional weapons and drones would be steadily increased, partly in order to reduce reliance on nuclear weapons. Multilateral discussions might begin on dealing with verification issues and other problems associated with the elimination of nuclear weapons, but these will not be fully resolved to the satisfaction of all the relevant states within a foreseeable time horizon. A nuclear weapons convention that actually eliminates nuclear weapons cannot be negotiated until these problems are resolved. Nevertheless, the long-standing promise to eliminate nuclear weapons might be sufficient to drive a slow and careful process, separate from a ban treaty that includes states with nuclear weapons, toward zero. Some non-nuclear-weapon states that oppose a ban treaty might play an important role in this process. Throughout this process, it seems unlikely that the views on nuclear deterrence of the states with nuclear weapons would change, at least until very low levels were reached. For their part, parties to a ban treaty would neither ask for nor receive extended nuclear deterrence. If this scenario is at all plausible, the world can look forward to a bumpy and dangerous ride but a ride that at least is probably moving in the right direction. No authoritative analysis exists comparing the risks of a world with and without nuclear weapons, and any such analysis would rest on a series of assumptions and hypothetical situations. Those committed to eliminating nuclear weapons immediately need to understand that this situation is fundamentally different from earlier struggles against, for example, smoking and pollution. In those campaigns, groups with no connection to tobacco companies or polluting industries could essentially overpower them by amassing sufficient political power and forcing major changes without their permission or cooperation. In the case of nuclear weapons, not a single weapon can be eliminated without the cooperation of the states that possess and control them. Because there is no way to force the changes demanded, cooperation, not confrontation, is essential. 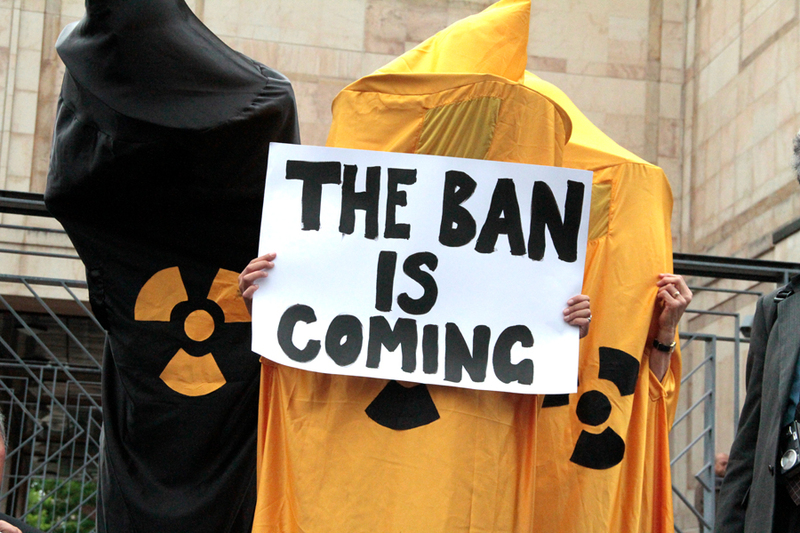 There is a risk that the ban campaign increasingly will resort to condemnation and ridicule of the nuclear-weapon states and their allies, making its goals even more difficult to achieve. Past instances, such as calling President Obama a hypocrite or labeling states that rely on extended deterrence “weasel states,” are examples of counterproductive rhetoric. For their part, those determined to stay with the status quo on nuclear deterrence need to understand the risks to civilization of that approach and that they cannot continue to ignore the demands from the majority of citizens on Earth. 1. See William Walker, A Perpetual Menace: Nuclear Weapons and International Order (New York: Routledge, 2012); Tanya Ogilvie-White, On Nuclear Deterrence: The Correspondence of Sir Michael Quinlan (New York: Routledge, 2011). 2. Max Fisher, “Full Transcript: VOX Interviews Defense Secretary Ash Carter,” April 13, 2016, http://www.vox.com/2016/4/13/11333276/ash-carter-transcript. 3. “Advance Policy Questions for James N. Mattis, Nominee to be Secretary of Defense,” n.d., p. 47, http://www.armed-services.senate.gov/download/mattis-apq-responses_01-12-17 (confirmation hearing, January 12, 2017). 4. For the current views of one of the four statesmen, see William J. Perry, My Journey at the Nuclear Brink (Stanford: Stanford University Press, 2015). For a series of authoritative essays on deterrence, see George P. Shultz, Sidney D. Drell, and James E. Goodby, eds., Deterrence: Its Past and Future (Stanford: Hoover Institution Press, 2010). 5. See Ward Wilson, “The Myth of Nuclear Deterrence,” The Nonproliferation Review, Vol. 15, No. 3 (November 2008): 421-439. 6. Legality of the Threat or Use of Nuclear Weapons, I.C.J. Reports, July 8, 1996, http://www.icj-cij.org/docket/files/95/7495.pdf. 7. See Justin Anderson, “Law of War Considerations in Fielding Nuclear Forces,” Arms Control Today, September 2016. 9. 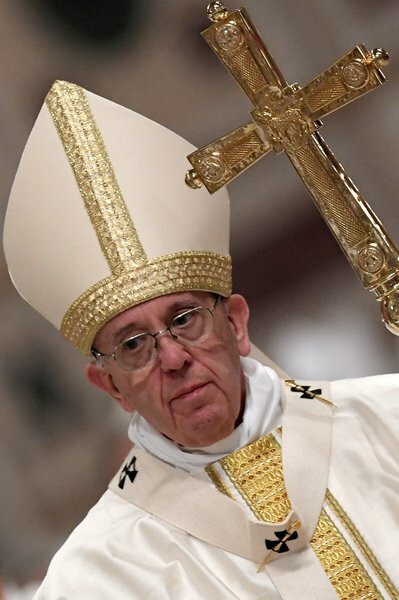 For a recent discussion of these issues from a religious perspective, see Gerard Powers, “From Nuclear Deterrence to Disarmament: Evolving Catholic Perspectives,” Arms Control Today, May 2015. 10. Archbishop Bernardito Auza, Statement to the UN General Assembly First Committee, October 17, 2016, https://holyseemission.org/contents//statements/58054d4835073.php. 11. See Ira Helfand, “Nuclear Famine: Two Billion People at Risk?” 2nd ed., Physicians for Social Responsibility, November 2013, http://www.psr.org/assets/pdfs/two-billion-at-risk.pdf. This new understanding was essentially an extension of the understandings about nuclear winter because many aspects of these findings had been known for some time. With respect to the recent research cited above, the specific scenario studied involved “only” 100 nuclear explosions; but these were on Indian and Pakistani cities, resulting in huge fires, which led to the drastic atmospheric effects in the models used. Thus, claims that “any” use of nuclear weapons or use of a tiny percentage of the world’s arsenal in any scenario would inevitably lead to these same conclusions are clearly not justified by the science. The use of a nuclear weapon against a naval vessel in the Pacific or against a few missile silos in North Dakota or Siberia would not lead to a catastrophic change in the earth’s climate or mass starvation. Yet, such use could lead to a general nuclear exchange, which would have even worse consequences than the scenario studied. 12. For a discussion of the humanitarian initiative, see Ira Helfand, “The Humanitarian Consequences of Nuclear War,” Arms Control Today, November 2013. See also “Humanitarian Campaign Challenges the Nuclear Weapon States,” Strategic Comments, Vol. 20, No. 7 (2014); Edward Ifft, “The Nuclear Weapon States and the Humanitarian Campaign,” Proceedings of the Annual Meeting of the Institute for Nuclear Materials Management, July 2015. 13. For a draft of a possible ban treaty, David A. Koplow, “What Would Zero Look Like? A Treaty for the Abolition of Nuclear Weapons,” Georgetown Journal of International Law, Vol. 45, No. 3 (Spring 2014). 14. “America’s Strategic Posture: The Final Report of the Congressional Commission on the Strategic Posture of the United States,” U.S. Institute of Peace, 2009, http://www.usip.org/sites/default/files/America’s_Strategic_Posture_Auth_Ed.pdf. 15. U.S. Department of Defense, “Nuclear Posture Review Report,” April 2010, http://www.defense.gov/npr/docs/2010%20Nuclear%20Posture%20Review%20Report.pdf. 16. For a book that explores these issues in considerable detail by the co-director of the group that prepared the Nuclear Posture Review, see Brad Roberts, The Case for U.S. Nuclear Weapons in the 21st Century (Stanford: Stanford University Press, 2015). For a recent comprehensive study of the roles and functions of U.S. nuclear weapons, see Rebecca K.C. Hersman, Clark Murdock, and Shanelle Van, “The Evolving U.S. Nuclear Narrative: Communicating the Rationale for the Role and Value of U.S. Nuclear Weapons 1989 to Today,” Center for Strategic and International Studies, October 2016. 17. Stephen Erlanger, “Tested by Russia, NATO Struggles to Stay Credible,” International New York Times, May 31, 2016. 18. For a French view, see Bruno Tertrais, “In Defense of Deterrence: The Relevance, Morality and Cost-Effectiveness of Nuclear Weapons,” Institut Francais des Relations Internationales (IFRI), Fall 2011. 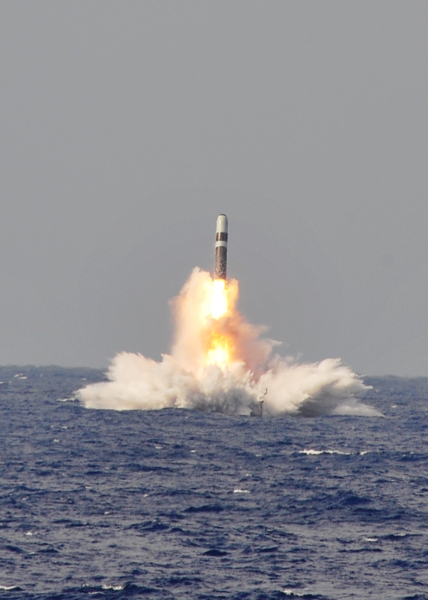 The British view was expressed succinctly by UK Defence Secretary Sir Michael Fallon: “Britain’s ballistic missile submarines are the ultimate guarantee of our nation’s safety—we use them every day to deter the most extreme threats.” “Building to Start on New Nuclear Submarines as Government Announces £1.3 Billion Investment,” October 4, 2016, https://www.gov.uk/government/news/building-to-start-on-new-nuclear-submarines-as-government-announces-13-billion-investment. 19. “The ambassador of the Russian Foreign Ministry: We are concerned about the situation with the nuclear facilities in Ukraine,” RIA Novosti, February 18, 2015 (in Russian). 20. For further Russian views on deterrence, see Alexei Arbatov and Vladimir Dvorkin, “Moving Away From Mutual Nuclear Deterrence,” in Nuclear Weapons After the Cold War, ed. Alexei Arbatov and Vladimir Dvorkin (Moscow: R. Elinin Publishing House, 2008), pp. 88-114. See also Dmitri Trenin, “2014: Russia’s New Military Doctrine Tells It All,” Carnegie Moscow Center, December 2014; Kristin Ven Bruusgaard, “Russian Strategic Deterrence,” Survival, Vol. 58, No. 4 (August-September 2016): 7-26. 21. See James M. Acton, “Deterrence During Disarmament: Deep Nuclear Reductions and International Security,” Adelphi Paper, Vol. 50, No. 417 (2010). 22. Corentin Brustlein, “Conventionalizing Deterrence? U.S. Prompt Strike Programs and Their Limits,” Proliferation Paper, No. 52 (January 2015). For an interesting view on conventional deterrence, see Graham T. Allison, “Deterring ISIS,” The National Interest, September/October 2016. 23. James E. Goodby, “The Survival Strategies of Small Nations,” Survival, September 2014. 24. Proposals for a UN “Legion” were put forward as long ago as 1948 by Trygve Lie, the first UN secretary-general. 25. For a fresh view on nuclear Nonproliferation Treaty review conferences, see Robert Einhorn, “The NPT Review Process: The Need for a More Productive Approach,” Arms Control Today, September 2016. Edward Ifft, an international relations officer at the U.S. Department of State and adjunct professor in the Walsh School of Foreign Service at Georgetown University, has been involved in negotiating and implementing nuclear arms control agreements for the past 45 years. 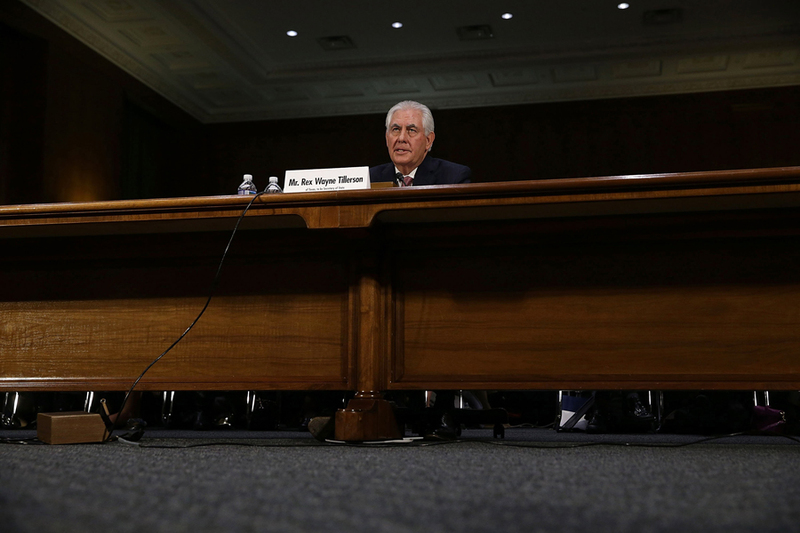 The views expressed are those of the author and do not necessarily reflect the policies of the U.S. State Department or Georgetown University. The nature of contemporary nuclear risk has evolved. Nuclear arms control needs a new paradigm. The current approach, focused on deployed strategic nuclear “delivery vehicles”—long-range bombers, nuclear ballistic missile submarines, and intercontinental ballistic missiles (ICBMs), together often referenced as the nuclear triad—was forged during a Cold War standoff between two heavily armed superpower rivals, the United States and the Soviet Union. This approach deserves recognition for playing an important role in limiting and ultimately contributing to the reduction of their respective deployed nuclear forces, but it is unable to address the nuclear competition within the present geostrategic environment, where multiple states view nuclear forces as critically important to their long-term security. If nuclear arms control is to play a key role in preventing friction between nuclear powers and reducing nuclear risks in the 21st century, there needs to be a shift in focus and an expansion in participants. The importance of developing new ideas is urgent due to the lack of agreements or confidence-building measures between most of these nuclear states and the poor health and uncertain future of U.S.-Russian nuclear arms control. The latter two countries remain the only states to negotiate and implement agreements limiting their strategic nuclear delivery vehicles. In an era of renewed arms competition by major powers across multiple domains, Washington and Moscow deserve credit for their continued willingness to exchange information on and allow on-site inspections of their most powerful military forces. The Intermediate-Range Nuclear Forces (INF) Treaty, however, is on life support, with the United States and Russia charging each other with willfully violating the 1987 accord.1 Implementation of the 2011 New Strategic Arms Reduction Treaty (New START) continues to proceed relatively smoothly, but it has a built-in expiration date, either ending in 2021 or, if Washington and Moscow choose to exercise the accord’s one-time five-year extension, in 2026. Nuclear arms control negotiations can take years to reach an agreement, particularly when diplomatic relations are poor. 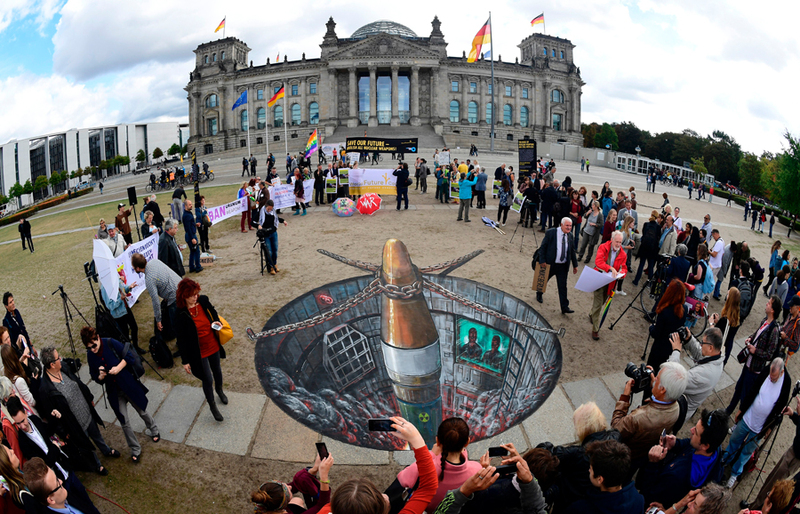 The clock is ticking on nuclear arms control, and the time to develop new approaches is now. The expiration of New START will likely mark the end of an arms control epoch. 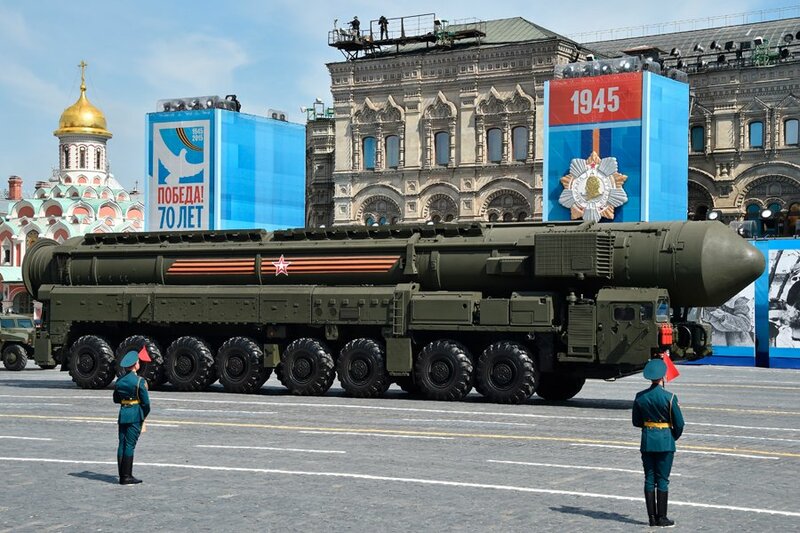 The treaty may represent the last in a series of agreements stretching back to 1972 that sought to achieve a balance between U.S. and Russian deployed, strategic nuclear delivery vehicles. During the Cold War, U.S. policymakers and strategists viewed nuclear forces as essential to deterring the Soviet Union; but many became concerned that the risks and costs of an unbridled nuclear arms race could lead to national bankruptcy, a superpower nuclear war, or both. As each side developed large and diverse arsenals, there was also an awareness that the size, structure, posture, and transparency (or lack thereof) of these forces could play a significant, perhaps decisive role in catalyzing future nuclear crises. This led U.S. strategists and policymakers to conclude that the best means of addressing nuclear risk during an era of superpower competition was reaching agreements under which each side would limit and balance its deployed strategic offensive and defensive forces, that is, the nuclear triad of land-, sea-, and air-based weapons and anti-ballistic missiles. Recognizing that trust was absent between the two parties, negotiators sought to develop verification regimes for prospective arms control agreements that could walk a fine line between granting enough transparency to determine compliance or detect militarily significant cheating while not revealing so much information that one or both sides felt less secure. The challenges implicit to building trust between rivals further bolstered the case for focusing on deployed strategic delivery vehicles. Long-range bombers, nuclear-capable submarines, and ICBMs were relatively large objects; and satellite imagery, readily available to both sides by the late 1960s, could identify and track their numbers in the field. Cold War negotiators settled on “attributing” weapons to these systems, i.e., assigning a default number commensurate with the system’s maximum capability to deliver nuclear weapons, rather than attempting to develop intrusive measures to directly count the exact number of warheads or bombs loaded on a strategic delivery vehicle under inspection, which would have been difficult for either side to accept at the time. After the end of the Cold War, both sides sought to develop approaches to count actual weapons in the stockpile, agreeing in principle in 1997 that this would be a key goal of “START III” talks, but these efforts ultimately did not bear fruit. Deterrence calculations and verification considerations thus informed an approach to arms control that concentrated on limiting deployed strategic delivery vehicles and their attributed, rather than actual, complement of weapons. This left most of the weapons in both sides’ active arsenals and overall stockpiles untouched, including any strategic nuclear weapons not currently in the field and all tactical nuclear weapons. With New START cut largely from the same cloth as the Strategic Arms Reduction Treaty, which entered into force in 1994 but was negotiated during the late Cold War period, U.S.-Russian nuclear arms control treaties and their verification regimes have primarily focused on the strategic platforms that deliver nuclear weapons, rather than the weapons themselves. To anyone not deeply familiar with this topic, it may come as a surprise that nuclear arms control treaties have never expressly required or provided procedures for counting or reducing the overall U.S. or Russian nuclear weapon stockpiles. This is not a criticism of past agreements, which implemented innovative concepts in an effort to slow and stabilize a breakneck nuclear arms competition between two superpowers. The nature of contemporary nuclear risk and competition, however, has changed, and nuclear arms control should adapt with it. In addition, with more than 30 years of experience in on-site inspections under their respective belts, the United States and Russia can change the arms control status quo by leveraging important lessons learned regarding managed access and operational security.2 This hands-on experience has enabled both sides to accept more intrusive verification measures with New START, including procedures likely unacceptable to both sides during the Cold War. 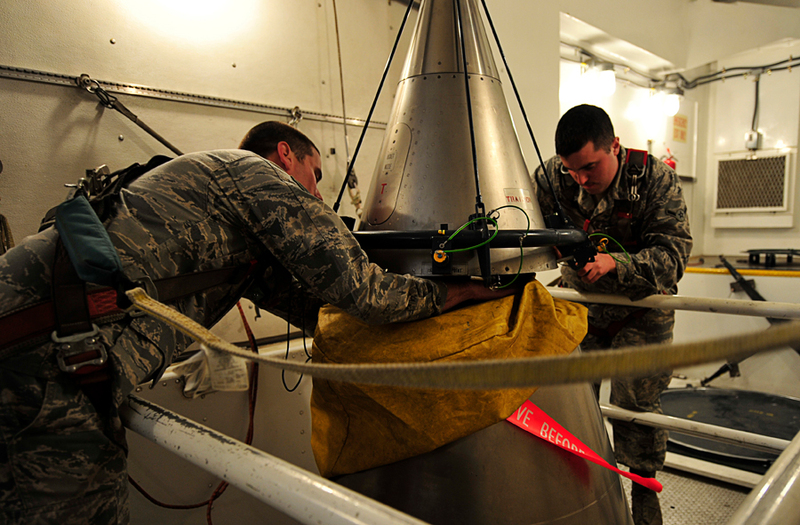 The treaty began an important shift away from a pure attribution approach; both parties now report the actual numbers of weapons loaded on ballistic missiles, and inspectors can verify that number on specific missiles as part of the treaty’s “Type One” inspections.3 New START and its continuing implementation demonstrate that familiarity with verification processes can open the door for increased intrusiveness from agreement to agreement. The previous focus on achieving a fine-tuned deterrence balance between the U.S. and Russian fleets of strategic nuclear delivery vehicles sought to eliminate any incentive for either Cold War superpower to launch a sudden, massive nuclear first strike. 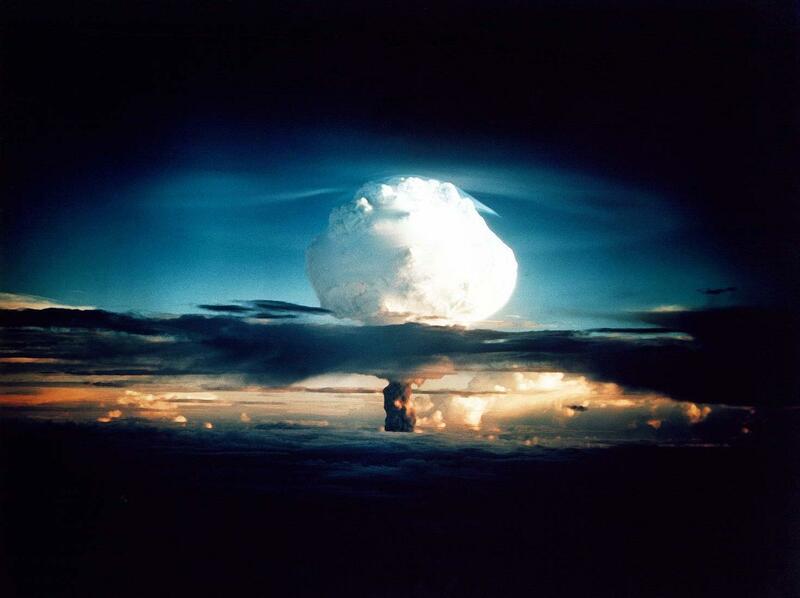 The nature of contemporary nuclear risk, however, has evolved. In dealing with Russia, for example, the United States must remain vigilant with regard to the existential threat posed by its strategic nuclear forces, although potential scenarios of brinkmanship and escalation are far more likely to involve Russia’s tactical nuclear systems and regional objectives. In terms of an arms race, the risk of instability and war is higher with regard to the nuclear competitions and ambitions of other actors. Future nuclear arms control agreements require a framework flexible enough to address the risks and costs of the present era, in which nine states field nuclear forces. One avenue for future nuclear arms control talks is a “deter and downsize” approach.4 Future negotiations, at first between the United States and Russia, later including other nuclear states, should shift from attempting to orchestrate a numerical balance between strategic delivery vehicles to a slow but steady reduction of states’ total nuclear weapons stockpiles. This framework would allow states to meet their security needs, as each one can continue to field a robust deterrent in the form of strategic delivery vehicles of its choosing, while committing to reducing nuclear weapons. Two assessments are central to this proposed shift. First, nuclear weapons stockpiles have a lesser deterrence value than deployed nuclear-capable delivery vehicles, primarily because a significant portion of the nuclear weapons in the world remains a stored, recessed, potential threat, as opposed to a direct, immediate, front-line threat, such as operational systems. Second, if the stockpiles of the nine current nuclear states remain indefinitely unlimited and opaque, this absence of restraints or constraints will pose increasing risks and costs that are likely to affect all nuclear states. For example, not all nuclear states have the stringent safety and security standards of the United States. This raises the possibility that accidents, incidents, theft, or terrorism could affect one or more stockpiles, with likely direct and second-order effects for other nuclear states. Arms control efforts should reflect these dynamics. The nine current nuclear states, for the foreseeable future, will continue to field delivery vehicles for the purpose of nuclear deterrence, and they will resist significant constraints or reductions on these forces. Importantly, however, these forces can deter adversaries regardless of their specific weapons load-out because the numbers of weapons on any given system and their destructive yields will be unknown to other states. Indeed, the numbers of weapons mated to delivery systems does not necessarily need to be high for the purposes of stable deterrence, which is far more dependent on other factors, such as the ability of these systems to successfully avoid or survive an enemy attack. U.S. long-range bombers deter adversaries, for example, because they are capable of striking distant targets, however defended; the specific number of nuclear weapons carried by any given bomber is less of a consideration because it can only be assumed, not determined, by the other party. In short, it is delivery vehicles rather than stockpiles that deter. Accordingly, a future nuclear arms control framework could double down on this form of deterrence, dispensing with further limits or required reductions to delivery systems while committing all parties to a slow but steady downsizing of nuclear weapons stockpiles. Some might object to negotiations that do not aim to drive down the numbers of U.S. and Russian strategic nuclear delivery systems, but the global strategic balance has long ceased to hinge on the balance between the U.S. and Russian strategic nuclear triads and is dependent on a much broader suite of nuclear and non-nuclear capabilities fielded by multiple actors. Moreover, the United States under the limits established by New START can retain a nuclear force capable of imposing unacceptable costs against any opponent, however equipped or configured, for the foreseeable future. Should current modernization plans for the U.S. nuclear deterrent move forward as planned, the United States will field a diverse, flexible force that can continue to contribute to regional and global stability by responding to changes in strategy, force structure, posture, and “MIRVing”5 by other nuclear states, whether big or small.6 The highly capable U.S. delivery systems representing the next generation of nuclear-capable forces will be designed, for example, to defeat current and future air defenses and other means by which adversaries attempt to deny access to airspace and sea lanes. These nuclear-capable forces will continue to deploy regionally and operate globally, preventing potential adversaries from realizing diplomatic or strategic gains by rattling nuclear sabers or developing new systems. Although nuclear deterrence vested in delivery systems can provide significant stability between most of the current nuclear states—North Korea is considered a separate “hard case”—nuclear stockpiles (deployed weapons, stored weapons, and weapons awaiting dismantlement) pose a number of potential security and stability challenges that arms control should seek to corral. The U.S. arsenal is highly secure and deliberately engineered to be fail safe, but these safeguards cannot be assumed for all nuclear states. Above all, nuclear weapons themselves—not delivery vehicles, all of which are potentially dual capable and thus are not purely nuclear threats—should be identified as the destructive agents that negotiations should seek to limit and reduce. A compelling argument can be made to nuclear states that have not previously engaged in nuclear arms control negotiations or participated in agreements that the deter-and-downsize approach is viable for addressing key elements of nuclear risk. The framework proposed does not expressly limit or prevent these states from developing what they view as high-value, high-prestige delivery systems, for example, ICBM programs that may be directly or closely related to space launch efforts. Moreover, if successful, it will help lower or cap the number of actual nuclear weapons available for employment against them by potential adversaries. Furthermore, some form of participation within future multilateral nuclear arms control negotiations, even if initially only at an observer level, can help facilitate future separate but related talks between certain nuclear states on related matters such as nuclear confidence-building measures. We propose that a deter-and-downsize agreement apply graduated, percentage-based reductions to participants’ total nuclear stockpiles, perhaps 20 percent every 10 years. This would commit each participating state-party to engage in significant reductions of stockpiles weapons but over a period of time long enough to carefully plan and execute the processes required to disassemble the weapons safely and securely, monitor compliance by the other party or parties, and continually assess if further implementation of the agreement remains in the national interest. Moreover, the initial cut for the United States and Russia would focus on weapons already in the dismantlement queue and long-term storage. Indeed, the United States is already steadily reducing a backlog of long-retired weapons. This proposed pace of reductions is also reasonable in the context of historical stockpile reductions in the United States and Russia. Based on unclassified numbers, since its Cold War peak, the United States has reduced its total nuclear weapons stockpile at a pace roughly equivalent to 34 percent every 10 years.7 For Russia, there has been an estimated stockpile reduction of roughly 50 percent every 10 years since its peak, albeit more quickly in the first 10 years and a little slower in the following 20 years.8 Although these calculations are based on unclassified estimates, they provides enough context to suggest that 20 percent reductions every 10 years is not overly ambitious. Other nuclear states have argued that they will not join a future nuclear arms control arrangement until the United States and Russia are at lower numbers. A future pact can be designed to allow for different levels of state engagement, building toward full participation in inspections and reductions. A crawl-walk-run approach would benefit states that have never participated in nuclear arms control agreements; early steps could include sending observers to a treaty review conference or on-site inspections, for example, along with other initiatives to become familiar with relevant treaty processes. Verification of a total stockpile approach would require future negotiators to break new ground, but some current initiatives and a number of past practices from earlier treaties can provide building blocks for a new regime. We propose a three-part approach, with an information exchange and inspection regime tailored to each of the major phases within the life cycle of a finished nuclear weapon: production, deployment, storage, and dismantlement. The parties should begin with an initial exchange of information based on these categories at entry into force, including numbers and locations of weapons, and update that data quarterly or semi-annually. Notifications reporting any significant changes in numbers of weapons by location, such as 10 or 20 percent, could supplement these regular data exchanges. This approach would replace the current New START practice of an annual data exchange and notifications solely reporting on deployed weapons, providing a regular accounting process for total stockpiles that would also offer greater transparency on nuclear weapons movements that could cause concern and potentially undermine stability. The structure of the data exchange should be complemented by the inspection framework. Although a weapons-focused arms control treaty would necessitate an intrusive inspection regime to verify compliance, New START already has established a precedent for inspectors to get very close to weapons loaded on delivery vehicles. Developing an inspection protocol for deployed weapons can build on the current treaty’s Type One inspections, which currently allow inspectors to view bomb bays and missile front sections, albeit with weapons shrouded, and verify the number of deployed nuclear weapons. A second type of inspection would concentrate on stored weapons. These inspections would take a holistic view of sites similar to that employed by the inspection regimes established by the Chemical Weapons Convention (CWC) and the International Atomic Energy Agency’s additional protocol agreements. Both implement verification regimes permitting close inspection and investigation of sensitive areas.9 The CWC “challenge inspection,” for example, allows the inspecting party to monitor all of the inspected facility’s entry points for the full duration of the inspection to ensure no attempts are made to surreptitiously remove weapons from the site.10 This second type of inspection may be conducted less frequently than those of deployed weapons; each individual state-party would commit to hosting at least one of these inspections in any given treaty year, and all parties would further agree to an annual meeting to collectively determine whether more frequent inspections were necessary. By deliberately limiting the number and frequency of inspection team visits to storage sites, this approach encourages states to store weapons away from the delivery vehicles, which are located at bases that are significantly more likely to be subject to on-site inspections. When inspections of storage areas do occur, however, they will provide an accurate count of these nondeployed weapons. The third type of inspection would focus on production and dismantlement facilities. Verifying production and dismantlement of nuclear weapons poses difficult questions because states are loath to provide any insight into highly classified information such as weapons designs. Work has advanced, however, on monitoring and tracking weapons, including a recent project sponsored by the U.S. Department of State’s Key Verification Assets Fund aimed at studying the possible future development of a smart, sensing skin for weapons storage canisters, which could record any tampering with the canister or removal of its weapon, among other data. This and other technical advances could provide a systematic picture of the movement of weapons across the life cycle up to the threshold of dismantlement. Although weapons production and dismantlement would remain hidden from view, if a state had high confidence in the movement of the weapon and were allowed to monitor and measure each facility’s “output” (completed weapons from a production facility or fissile material and perhaps certain parts of the weapon’s assembly from a dismantlement facility), this may provide sufficient confidence that a weapon was assembled or taken apart. 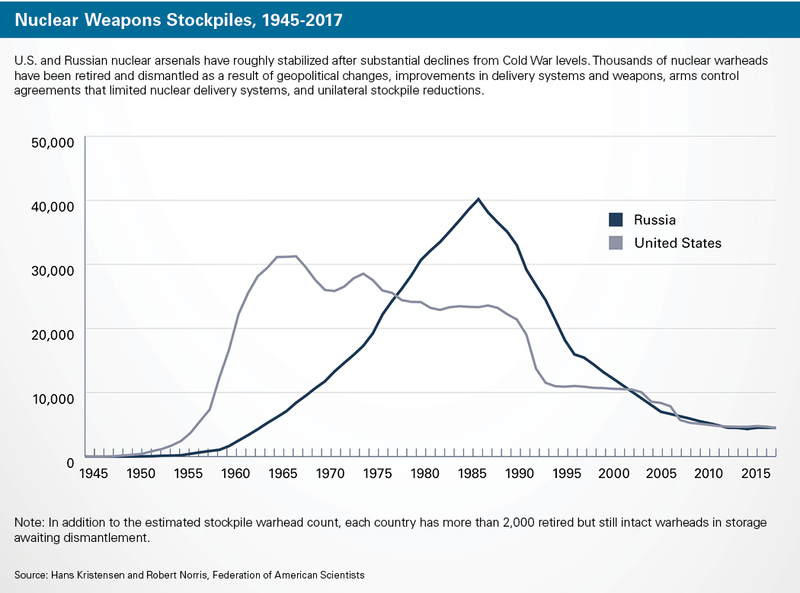 Moving arms control to a total stockpile approach and reducing this stockpile would require the United States and Russia to move out of a comfort zone established by years of implementing treaties centered on strategic delivery vehicles. A deter-and-downsize framework, however, opens up a conversation on how these states can meet security requirements while working to reduce their nuclear weapons stockpiles slowly but steadily. In time, this approach can include other states that are determined to field a nuclear deterrent force but can buy into efforts to reduce overall global nuclear risks. 1. U.S. Department of State, “Adherence to and Compliance With Arms Control, Nonproliferation, and Disarmament Agreements and Commitments,” April 2016, p. 8, https://www.state.gov/documents/organization/255898.pdf. 2. The Intermediate-Range Nuclear Forces (INF) Treaty was the first nuclear arms control treaty to include on-site inspections. The development and implementation of this inspection regime informed subsequent negotiations and agreements. For a detailed overview of the INF Treaty on-site inspection regime, see Joseph P. Harahan, “On-site Inspections Under the INF Treaty,” U.S. On-site Inspection Agency, 1993, http://www.dtra.mil/Portals/61/Documents/History/On-Site%20Inspections%20INF%20Treaty-opt.pdf. 3. Bureau of Arms Control, Verification and Compliance (AVC), U.S. Department of State, “New START Treaty Inspection Activities,” February 2, 2017, https://www.state.gov/t/avc/newstart/c52405.htm; AVC, “Verification,” April 8, 2010, https://2009-2017.state.gov/t/avc/rls/139906.htm. 4. Justin Anderson and Darci McDonald, “21st Century Arms Control: A Framework for the Next Generation of Treaty Negotiations…and Treaty Negotiators,” in Project on Nuclear Issues: A Collection of Papers From the 2015 Conference Series, ed. Sarah Minot (June 2016), https://csis-prod.s3.amazonaws.com/s3fs-public/publication/160601_Minot_PONI2015_Web.pdf. 5. “MIRV” is an acronym for multiple independently targetable re-entry vehicle, i.e., several independent nuclear weapons placed on a single delivery vehicle, with each one capable of striking a different target. The ability to successfully develop this capability is considered a significant step in the maturation of a national nuclear weapons program and can significantly complicate adversary defense planning. “MIRVing” refers to the practice of placing multiple weapons on a single delivery system. 6. “Current modernization plans” refer to plans to field the Columbia-class submarines, the B-21 bomber, the Ground Based Strategic Deterrent (replacement for the Minuteman III intercontinental ballistic missile), the long-range standoff cruise missile, and the nuclear-capable F-35 and the National Nuclear Security Administration’s “3+2” approach on nuclear warheads. 7. “Fact Sheet: Increasing Transparency in the U.S. Nuclear Weapons Stockpile,” May 3, 2010, https://www.defense.gov/Portals/1/features/defenseReviews/NPR/10-05-03_Fact_Sheet_US_Nuclear_Transparency__FINAL_w_Date.pdf; “Fact Sheet: Transparency in the U.S. Nuclear Weapons Stockpile,” April 29, 2014, https://state.gov/documents/organization/225555.pdf. 8. Michael Krepon “Worth the Wait,” Arms Control Wonk, August 31, 2012, http://www.armscontrolwonk.com/archive/403524/worth-the-wait/. 9. The Model Additional Protocol provides International Atomic Energy Agency (IAEA) inspectors “complementary access” to suspect sites to “assure the absence of undeclared nuclear material and activities.” IAEA, “Model Additional Protocol to the Agreement(s) Between State(s) and the International Atomic Energy Agency for the Application of Safeguards,” INFCIRC/540, September 1997, art. 4(a)i. In addition to directly inspecting sites, inspectors can collect environmental samples for later analysis in an IAEA lab. Aabha Dixit, “Swipe Check: Collecting and Analysing Environmental Samples for Nuclear Verification,” IAEA, January 19, 2016, https://www.iaea.org/newscenter/news/swipe-check-collecting-and-analysing-environmental-samples-nuclear-verification. 10. Bureau of Industry and Security, U.S. Department of Commerce, “Chemical Weapons Convention: Challenge Inspection Overview,” Chemical Weapons Convention Bulletin, CWC-010 (May 2004). Justin Anderson is a research fellow at the National Defense University’s Center for the Study of WMD. Darci McDonald is a policy analyst principal at Science Applications International Corporation (SAIC). The views expressed in this article are those of the authors and do not necessarily reflect the official policy or position of the National Defense University, the Department of Defense, the U.S. government, or SAIC or any of its clients. Nuclear deterrence is a blunt instrument that cannot be tailored to evoke particular responses in particular situations. 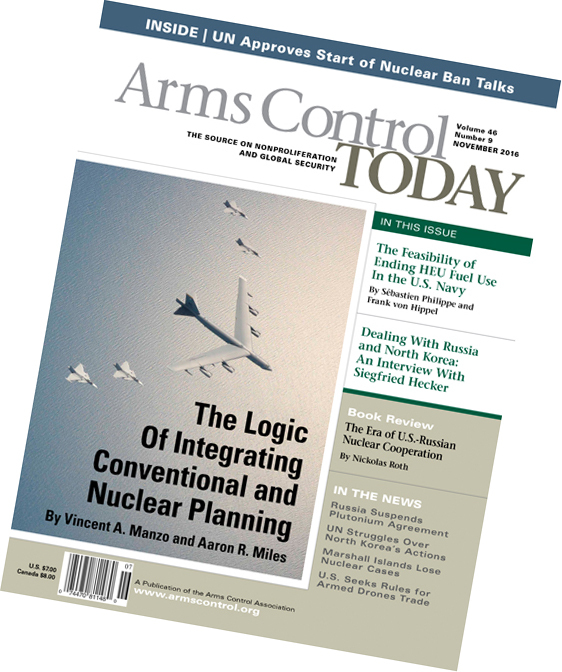 In the November 2016 edition of Arms Control Today, Vincent Manzo and Aaron Miles attempt to define and defend what they call the “logic of integrating conventional and nuclear planning.” Their logic is neither clear nor compelling. They make assertions regarding the benefits of “integration” to U.S. national security based on no more than psychological guesswork about how potential adversaries might behave in a crisis or ongoing conflict. The authors claim that such integration is essential for “managing escalation” in a conventional conflict. This statement implies that managing escalation so that nuclear weapons are not used or restricting their use to a very small number of detonations is something that military strategists know how to do. Neither Manzo, Miles, nor any other military officials or security policy advisers know how to manage or control the potential for escalation from a conventional to nuclear war and certainly not from the extremely unstable phase of conflict during which a small number of nuclear weapons has been used to a full-scale nuclear war. We can never have confidence in controlling this escalatory space because we cannot know or control the decision-making of potential adversaries. Nuclear deterrence is a blunt instrument that cannot be tailored to evoke particular responses in particular situations. We can never conclusively measure the effectiveness of strategies to deter nuclear use or manage escalation. We cannot effectively communicate subtle messages of resolve or restraint in the fog of war. To think otherwise is dangerous hubris and leads to high-risk strategy that is prone to failure in a crisis. The only tool that we have to deter an adversary from using nuclear weapons is to threaten severe consequences and hope the adversary perceives the risks in the way we intend them to be perceived. That is why the United States and its allies must keep the threshold for nuclear use as high as possible. In the European context, this means having the ability to defeat any potential Russian conventional attack on NATO with conventional military force. In Asia, it means maintaining the military capability to defend Japan, South Korea, and Taiwan without resort to nuclear weapons. If Russia or any other state were to escalate to the use of tactical nuclear weapons, the United States and its allies have always maintained limited nuclear options that could be employed. Currently, these include the B61 nuclear bomb and the W80 cruise missile warhead that can be employed with a yield of five kilotons or less. The improved B61-12 nuclear bomb, to be deployed in 2022, will have even more capability for “tactical” strikes. But the United States should always declare that even tactical nuclear use would be a last resort and keep such capabilities and the rhetoric regarding their use recessed and nonprovocative. Why? For precisely the reason mentioned above, which is that we have no confidence that nuclear war, once initiated, could be kept limited. This conclusion was reached in 1983 after senior U.S. national security decision-makers incorporated top-secret U.S. war plans into the most realistic war-game exercise involving nuclear weapons ever conducted by the U.S. government. During this exercise, the U.S. and allied military officers who played the Soviet side interpreted small “tactical” nuclear strikes as an attempt to destroy the Soviet Union and responded with an enormous nuclear salvo against the United States. The United States responded in kind, destroying much of civilization. In summary, Manzo and Miles bring nothing new to the conversation on limited nuclear war and escalation. The recommendation to increase the ability of our forces to operate in a nuclear environment is a sound one, but that does not require the acquisition of new nuclear weapons or changes in declaratory strategy. They offer no convincing evidence that increasing the visibility of U.S. military planning for the transition between conventional and nuclear war will make it less likely that the deadly threshold to nuclear war will remain uncrossed in a conflict. Rather, potential nuclear adversaries are likely to see such planning as an indication that our adversity to nuclear use in response to conventional crises has decreased, an outcome that undermines global stability and raises the risks of nuclear war. The president declares the United States must be “top of the pack” in nuclear weapons. The Trump administration is preparing to undertake the fourth Nuclear Posture Review (NPR) since the end of the Cold War. The study could set in motion significant changes in the role of nuclear weapons in U.S. strategy, the plans for maintaining and upgrading nuclear forces, the nuclear force structure requirements and costs, and the overall U.S. approach to nuclear arms control and nonproliferation. This comes as President Donald Trump has declared his ambition to “greatly strengthen and expand” U.S. nuclear weapons capabilities, which are already substantial, and has criticized the 2010 New Strategic Arms Reduction Treaty (New START) with Russia, suggesting he may be looking to change nuclear policy in significant ways. Since the end of the Cold War, each administration has conducted such a comprehensive review. The most recent one, completed in April 2010, said that the top priority of the U.S. nuclear agenda should be the pursuit of a world free of nuclear weapons through U.S. leadership to bolster the nonproliferation regime and achieve further reductions in nuclear arsenals. The new NPR will be completed as the Trump administration is making decisions with long-term security and budgetary implications. Trump will need to decide, with Russian President Vladimir Putin, whether to extend New START and its monitoring regime for five years beyond its February 2021 expiration date, negotiate a follow-on agreement, or go forward without legally binding, verifiable limits on the world’s two largest nuclear arsenals. This decision, among other factors, will determine whether the United States is seen to be meeting its nuclear disarmament obligations under Article VI of the nuclear Nonproliferation Treaty (NPT), which obligates nuclear-weapon states to pursue nuclear disarmament. The NPR may also affect the current plans to sustain and upgrade each element of the U.S. strategic arsenal, including new long-range, stealthy strategic bombers; a fleet of 1,000 new nuclear-capable air-launched cruise missiles; a new fleet of 14 strategic submarines; 400 new ground-based intercontinental ballistic missiles; and upgraded nuclear command-and-control systems. Congressional Budget Office (CBO) estimates the cost at more than $400 billion in fiscal years 2017-2026 and perhaps more than $1 trillion over the next 30 years—a price tag that could squeeze out other high-priority national security programs. Unlike then-Sen. Barack Obama (D-Ill.), who campaigned for the presidency in 2008 with a detailed nuclear-risk reduction strategy, Trump has not presented his thinking in a formal way. Rather, he has made a series of controversial, seemingly impulsive, and sometimes contradictory comments on nuclear weapons. If translated into policy, some of Trump’s pronouncements would represent a radical break from long-standing U.S. policies to reduce the role and number of nuclear weapons. In some cases, Trump’s own Cabinet members have disagreed with his statements, raising further questions about the direction of the administration’s policies. The 2010 NPR determined that “Russia remains America’s only peer in the area of nuclear weapons capabilities.” The United States and Russia are estimated to have 4,018 and 4,500 warheads, respectively, stockpiled and assigned for military use. Under New START, each will be limited to 1,550 strategic deployed warheads on no more than 700 nuclear delivery vehicles until 2021. The next largest nuclear arsenals are those of France, with 300, and China, with 280 warheads of all types. In a pre-inauguration interview with the The Times of London, Trump said that “nuclear weapons should be way down and reduced very substantially.” Yet, in his first telephone call with Putin after taking office, Trump seemed to put U.S. support for New START in doubt. According to a Feb. 9 Reuters account, Trump denounced the agreement when Putin suggested the two countries might agree to extend the treaty for five years, an option provided in the treaty’s terms. In a Feb. 23 Reuters interview, Trump called New START a “one-sided” agreement. Some of Trump’s comments conflict with the findings of 2013 Pentagon nuclear strategy report that said the United States could meet its security obligations and “maintain a strong and credible strategic deterrent” with “up to a one-third” reduction in deployed strategic warheads from the level established by New START. Trump’s suggestion that the United States must increase its nuclear “capacity” may encourage those who would like to overturn existing policy and allow for the pursuit of new types of nuclear warheads. The Defense Science Board, an advisory panel, urged the new administration in a December 2016 report to consider producing lower-yield weapons to provide a “tailored nuclear option for limited use.” It also questions the ability to maintain warheads in the absence of explosive testing, which is prohibited by the 1996 Comprehensive Test Ban Treaty, which the United States has signed but not ratified. Some Democrats, including Sen. Dianne Feinstein (D-Calif.), have already signaled their opposition. With the majority of subcabinet positions at the Defense, State, and Energy departments unfilled, the shape, direction, and pace of the new review is uncertain. But there is little doubt it will have far-reaching implications. Rep. Ted W. Lieu (D-Calif.) and Sen. Edward J. Markey (D-Mass.) introduced legislation that would prohibit the president from launching nuclear weapons without first having Congress expressly authorize such a strike. Four days after President Donald Trump’s inauguration, Rep. Ted W. Lieu (D-Calif.) and Sen. Edward J. Markey (D-Mass.) introduced legislation that would prohibit the president from launching nuclear weapons without first having Congress expressly authorize such a strike. The current U.S. “launch under attack” nuclear posture calls for the president to order the launch of hundreds of nuclear warheads deployed on alerted strategic land-based and sea-based intercontinental ballistic missiles. The orders can be executed by the president within a matter of a few minutes without the approval of any cabinet official or any members of Congress, according to specialists familiar with the procedures. 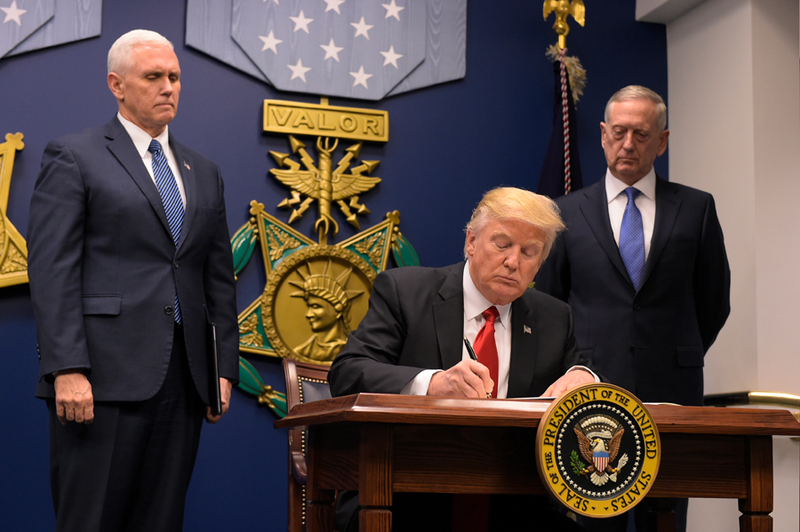 The bill, which was originally introduced in 2016, is a response to what Lieu calls Trump’s “desire to be ‘unpredictable’ with nuclear weapons.” The country’s founders “created a system of checks and balances, and it is essential for that standard to be applied to the potentially civilization-ending threat of nuclear war,” Lieu said in a Jan. 24 joint statement. Yet, there is no official policy of no first use of nuclear weapons; and there is no requirement that Congress must authorize the use of military force, formally declare war, or even be consulted before the president orders a U.S. nuclear strike. “Neither President Trump, nor any other president, should be allowed to use nuclear weapons except in response to a nuclear attack. By restricting the first use of nuclear weapons, this legislation enshrines that simple principle into law,” Markey said in the Jan. 24 statement. 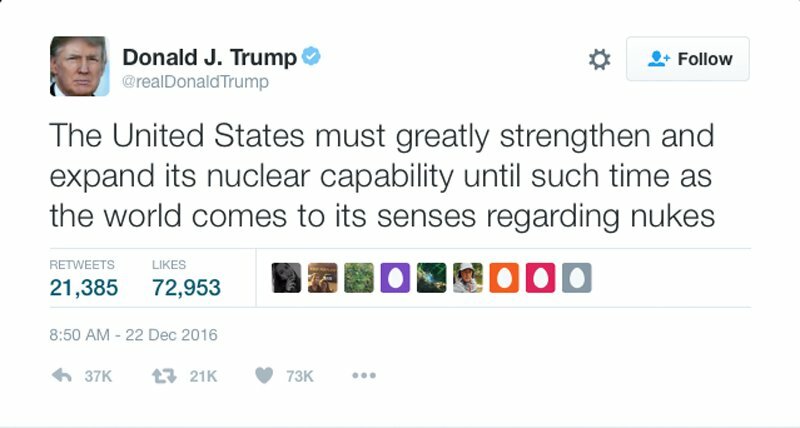 Do his 23 words foreshadow a fundamental shift from reducing nuclear arsenals? Officials considered actions such as implementing a no-first-use policy and reductions in nondeployed warheads. President Barack Obama headed into the final days of his presidency with an unfinished nuclear weapons risk-reduction agenda. But as he prepared to hand off control of the nuclear arsenal to President-elect Donald Trump, his administration announced a further reduction to the U.S. nuclear-weapons stockpile. In a Jan. 11 speech at the Carnegie Endowment for International Peace, Vice President Joe Biden revealed that the administration had removed 553 reserve warheads from the military stockpile during the past year, reducing the arsenal to 4,018 warheads. 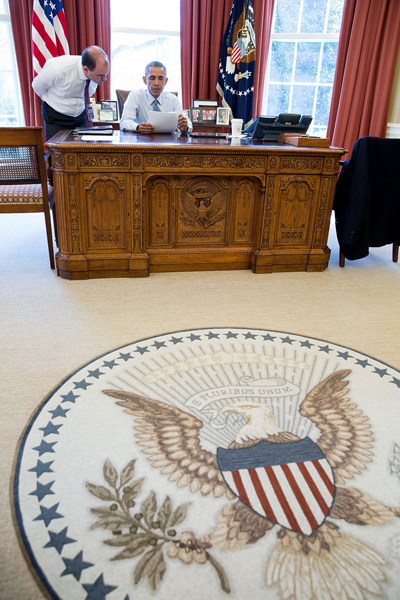 Overall, the administration reduced the stockpile by more than 1,000 warheads since taking office in 2009. In periodically making public the warhead numbers over the past eight years, the Obama administration has been more open about the size of the nuclear stockpile than any previous administration. The decision to retire additional reserve warheads came after Obama and his national security team for months had discussed measures to advance the nuclear risk-reduction goals the president first outlined in his April 2009 address in Prague. The administration has highlighted progress in the areas of nonproliferation, the security of nuclear weapons-usable materials, and disarmament over the past eight years. 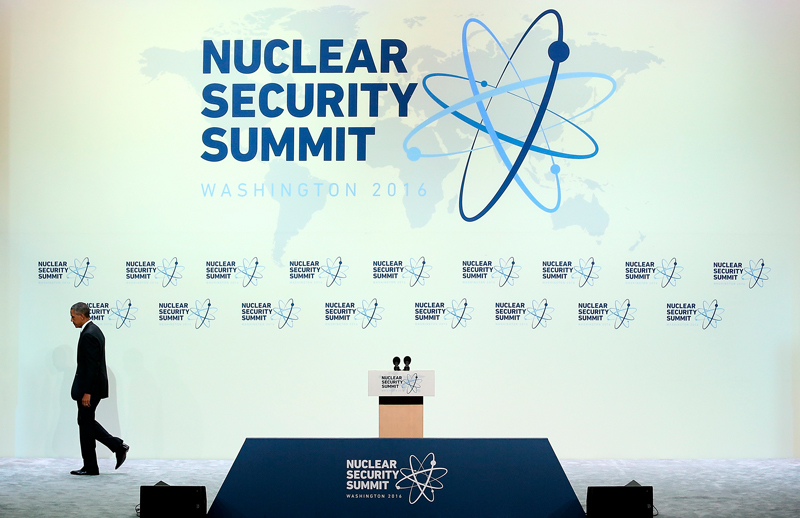 These include securing vulnerable nuclear materials around the world through the nuclear security summit process, measures to reduce the role of nuclear weapons in U.S. policy, the negotiation and U.S. Senate approval of the 2010 New Strategic Arms Reduction Treaty (New START), and the July 2015 nuclear agreement with Iran. But other key administration priorities, such as stopping the advance of North Korea’s nuclear and ballistic missile programs, achieving further reductions beyond New START, and ratifying the Comprehensive Test Ban Treaty (CTBT), have not been fulfilled. In remarks June 6 at the Arms Control Association’s annual meeting in Washington, Benjamin Rhodes, assistant to the president and deputy national security adviser for strategic communications, disclosed that the president was reviewing a variety of proposals on nuclear weapons for possible action before the end of his presidency. (See ACT, July/August 2016.) “[O]ur work is not done on this issue,” he said. The different categories of options under consideration included further reductions in the U.S. stockpile of nondeployed, or reserve, nuclear warheads; “additional steps” to lessen the role of nuclear weapons in U.S. policy and reduce the risk of inadvertent nuclear use; reaffirming the “international norm against” nuclear explosive testing; and putting “more nuclear material under appropriate monitoring,” he said. “Our administration has already made plain our concerns about how the modernization budget will force difficult trade-offs in the coming decades,” Rhodes said. The Security Council approved the resolution, the first of its kind to specifically support the CTBT, by a 14-0 vote, with Egypt abstaining. A total of 42 countries, including Israel, co-sponsored the resolution, which comes 20 years after the treaty was opened for signature. In addition, U.S. Energy Secretary Ernest Moniz announced at an International Atomic Energy Agency meeting on nuclear security in December that the United States is “embarking on an effort to dilute and dispose of approximately six metric tons of excess plutonium” and is consulting with the IAEA on agency monitoring and verification of the process (See ACT, January/February 2017). Yet, no action was taken on most of the options Rhodes said were under consideration. “We did not accomplish all that we hoped,” Biden said. News reports last summer and fall indicated that the administration considered adjusting U.S. nuclear declaratory policy to state that the United States will not be the first to use nuclear weapons in a conflict. Washington retains and has always retained the option to use nuclear weapons first in extreme circumstances, even if the United States or an ally has not suffered a nuclear attack. Biden said that both he and Obama strongly believe that the sole purpose of U.S. nuclear weapons should be to deter a nuclear attack against the United States or its allies. But Obama reportedly decided not to adopt a no-first-use policy due to concerns expressed by some members of his cabinet and close U.S. allies. The president also considered reducing the number and diversity of deployed strategic nuclear weapons, according to a September 2016 article in The Guardian newspaper. Obama, with the support of the Defense Department, determined in 2013 that the United States could reduce the size of the deployed arsenal by up to one-third below the New START limit of 1,550 deployed strategic warheads. Yet, the president did not unilaterally cut the size of U.S. forces. Rather, he invited Russia to negotiate a further one-third reduction of each country’s strategic nuclear arms, an offer that Moscow has repeatedly rebuffed. Other options reportedly considered included reducing the alert status of the nation’s land-based intercontinental ballistic missile force, reducing military stockpiles of nuclear weapons-useable fissile materials, appointing a blue ribbon presidential commission to assess and identify possible alternatives to current U.S. nuclear modernization plans, and delaying the planned purchase of a new fleet of 1,000 nuclear-capable air-launched cruise missiles. Although Rhodes in June had expressed concern about the affordability of the nuclear modernization plans, a senior administration official praised the current plans for the nuclear weapons and related infrastructure, which could cost more than $1 trillion over the next 30 years, in a Jan. 4 email to Arms Control Today. “[W]e’re sustaining deterrence by taking steps to ensure that all three legs of our nuclear triad do not age into obsolescence,” the official said.